Entry doors provide a lasting impression. Many homes that are thought of to have that “curb appeal” have a beautiful front door. Entry doors add an element of comfort and style. They are also an investment that often pays for themselves through the recouped cost during resale and in energy savings. 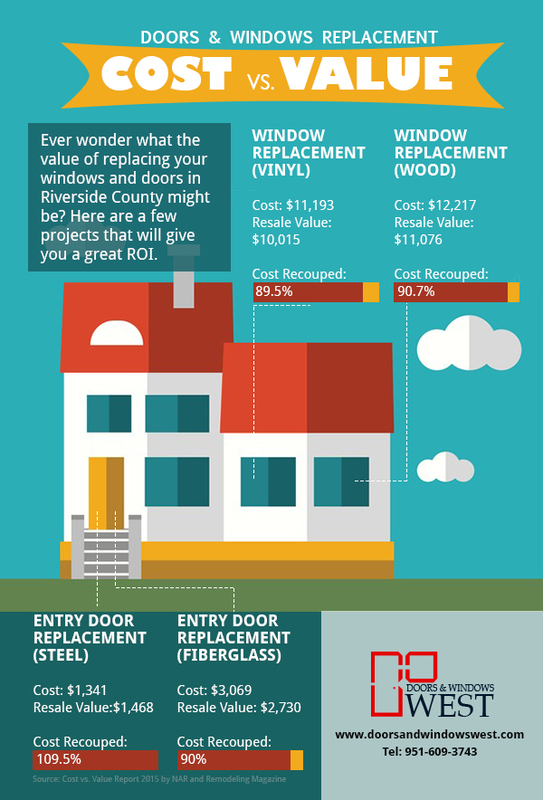 Check out this inforgraphic on The Cost vs. Value of Entry Door Replacement). Doors and Windows West works with top manufacturers to ensure you receive the best selection of entry doors. You can begin by selecting an entry door material. The top priority for entry doors is to be functional. Take note of the elements your entry door needs to withstand. Fiberglass front doors are very durable and affordable. They require very little maintenance. Their foam core also acts as a thicker insulator than wood doors. Fiberglass entry doors lack the actual wood grain, however there are many different finishes available, including a wood grain look. Natural wood grain is beautiful, but wood entry doors do require maintenance. Depending on the elements of sun and moisture, wood doors can chip, crack, and warp. If going with a wood door, invest in a durable stain or high gloss finish to maximize the life of the door. 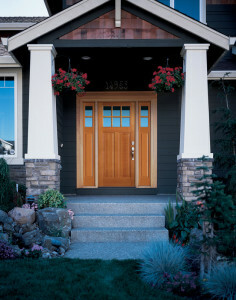 Wood front doors are typically more expensive than fiberglass or stainless steel. A major benefit of stainless steel is how strong it is, however it is more prone to rusting. Unlike wood, stainless steel front doors won’t crack, chip, or warp. Stainless steel entry doors are also rather affordable. The options are vast when it comes to customization for front doors. From the texture, color and finish to the decorative glass design and panels. This is where our manufacturers’ catalogs come in handy. Browse an assortment of entry doors. Let us know if you see something you like. Perhaps you want to combine a few styles. We can give you some pointers on materials and styles that will work well.